Priest Oleg Vrona, the rector of St. Nicholas Church in Tallinn, speaks about the Christian attitude towards patience and its goodness, the virtue, which shows our trust in Christ. As a young man, father Oleg lived in Pukhtitsa Convent, where he became convinced that patience isn’t something impossible; it’s a very useful quality for everyone. This article is an example of it. The second time I came to the Pukhtitsa was in March 1978; that time it wasn’t a pilgrimage, I came there to get ready for my ordination. I was checked in at the guesthouse, the one “on the hill”, where I had stayed before. I liked that place. The time I spent in its ascetic cell, hidden in the basement, wasn’t tedious at all. Every new day there came someone to share the cell with me. Some of those roommates were rather experienced pilgrims; with their bushy beards and long hair tied back with a ribbon, they looked exactly like real monks. They would tell me captivating true-to-life stories about monastic life in those few monasteries that by some miracle hadn’t been closed and defiled. They boasted about knowing the names of abbots, schemamonks and mysterious clairvoyant elders, and I was almost fully ignorant of the topic. We would often go on talking even when it was well past midnight. Obviously, I had to resist the temptation to oversleep and miss the Midnight Office in the morning. And by the way, I was trying my best not to oversleep services. Now it seems, I was quite successful. My attitude towards the services was the criterion for the abbess and nuns to assess my readiness and eligibility for ordination. My preparation for ordination was as follows: Midnight Office and Divine Liturgy in the morning, then work in the convent, and, finally, Vespers and Matins in the evening. So it continued day after day. Luckily enough, I had an old Book of Hours, published, I assume, before the Revolution. A chorister had given it to me, when I was singing in a choir in a St. Petersburg church, and I quickly learned how to read fluently in old-Slavonic. In the convent this turned out to be a very useful skill. At first, I was entrusted with reading the ninth Hour, then Psalm 103, and after that followed the Six Psalms, a kathisma and a canon. The nuns would never let me read the Midnight Office; they read it themselves, and I was to read the hours and the Epistles. All in all, as I was supposed to acquire the essential knowledge, I was to read everything (or almost everything) that an ordinary acolyte usually read, either in a monastery, convent or a parish church. I was to come to the church a bit earlier in order to find the nun responsible for order of services, and learn what kind of service we’d have that night—a simple one, an all-night Vigil, or Polyeleos. And the nun would give me instructions on who had to read the verses of the canon, and how many were to be read. She would also help me figure out how to read the troparia and kontakia during the Hours. There were two nuns who looked after the order of services—Nun Seraphima and Nun Angelina. They were both in their fifties. In my opinion, they were two complete opposites, but very generous opposites. Mother Angelina was loquacious, smiling and straightforward. When explaining something about the service, she treated me as an equal, as if I was literally her colleague, who had just slightly forgotten the typicon, and her task was to help me remember it. Mother Seraphima, on the contrary, was very reserved and taciturn; she would speak in a smooth, quiet voice, making her interlocutor concentrate on the subject of conversation. In her big grey eyes, which were like a mirror reflecting her soul, one could see, that she wasn’t attached to anything worldly, that she was engrossed in prayer. When I remember Mother Seraphima, I immediately recall a story, which the nuns once confided me in. The story touched me very much. 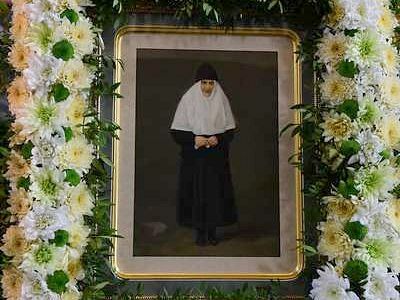 Here it is: When young Nun Seraphima came to Pukhtitsa Convent, she had no family but her mother. Because the were still young, the two had no real fear for her mother’s future. 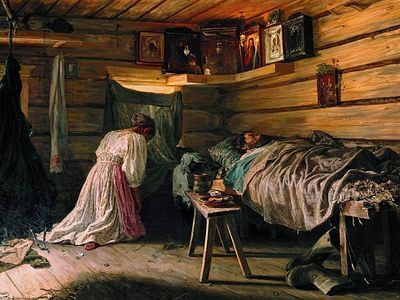 Nevertheless, the years flew by; finally, Seraphima faced a grave, unsolvable problem: how to fulfill her filial duty without leaving the monastery. The only way out seems obvious for everyone—to leave the monastery to take care of her ailing, elderly mother. Similar cases are a very common thing. I was acquainted with a nun from Tallinn, who had to leave Pukhtitsa Convent to take care of her farther and elder brother. The Soviet government had confiscated their farmland in Pechory and exiled them to Siberia. They came back home in poor health. Many years later, when both her father and brother died, the nun could not return to the convent—she was too old, and in addition chronically ill with pancreatitis. The nuns might have accepted her back, but she wouldn’t dare be a nuisance to them. What humility she had making this decision! Not insisting on your own will but obeying the will of God is a precious quality for a Christian. Fortunately the nun had a sister living in Tallinn with her family, so she had someone to take care of her. Nevertheless, she always missed her beloved convent; it was easy to see, and she told me about it many times as well. Was there a better way out for Nun Seraphima? Yes, there was one. Her mother could join the convent; but Abbess Barbara wouldn’t give her consent. The Pukhtitsa sisters lived in utter poverty in those post-war times. Nun Valeria, who used to help the abbess, once told me that there was no money to buy firewood and the nuns had to collect brushwood. Moreover, there were a many elderly nuns and a lack of resources to provide them with adequate care. The convent was also lacking nuns who could work in the dairy farm, to say nothing of haymaking—the most difficult work in the convent. If the abbess were to accept an elderly relative of one of the sisters she couldn’t dare refuse the others in a similar situation. Every time Seraphima’s mother came to the convent and was rejected by the abbess in her willingness to join the convent, she would go to the Holy spring, a place where the Mother of God once appeared. In the forest solitude, she would cry and pray to the Holy Mother of God, expressing her maternal sorrow. Once she came to the convent and, as usual, headed for the spring to pray to the Mother of God. 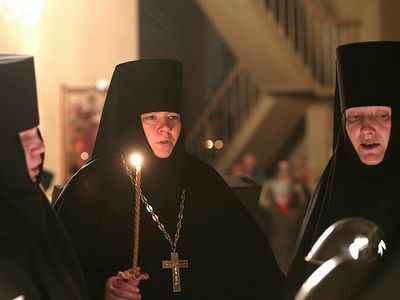 On the very same day (note that it was neither the day before nor the day after, but the very same day) the bishop who head of the Estonian diocese in those days, also came to Pukhtitsa Convent. As was his habit, he took a walk to the spring before the Vigil service. The bishop had almost reached his destination when he heard bitter sobbing coming from the forest. He went to the sound, and a few minutes later saw the elderly woman. Overcome by her sorrow, she had failed to hear the footsteps approaching. The bishop started to talk. The reason for her weeping touched his heart; with great determination, he promised to help her. On the very same day, after the All-Night Vigil, the bishop announced to the astonished abbess and nuns, that the on following day there would be a monastic tonsure in the convent. The sisters started anxiously asking each other who the bishop was going to tonsure a nun. And how amazed they were to see that the one to be tonsured was nun Seraphima’s mother. Many sisters were weeping tears of joy—they were happy for both the mother and the daughter. And what did the abbess feel at that moment? She must have also been pleased with the outcome. The bishop took responsibility for the future of the nun and her mother and eased the abbess’s conscious; after all, due to the circumstances, Abbess Angelina would have had had to hurt Seraphima and her mother. Wasn’t it a miracle? Of course, it was. And miracles always happen at the right time. We just need to wait for a while. Haste is a hindrance that doesn’t allow God to arrange our life in the way that is best for us. We read in Sirach, As his mercy is great, so is his correction also: he judgeth a man according to his works. The sinner shall not escape with his spoils: and the patience of the godly shall not be frustrated (Sirach 16:13-14). And now let us remember the words of God, In your patience possess ye your souls (Lk. 21:19). These words are so simple, but so difficult to fulfill. Glory be God, one day I saw it happen. Very nice article. I love those monasteries and their traditions. Glory to God!